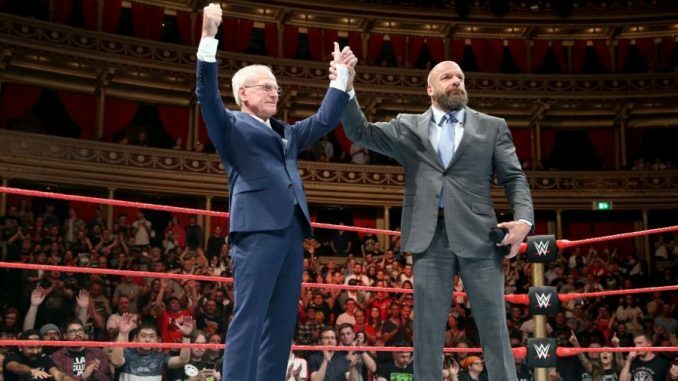 The WWE is adding further restrictions to several NXT UK performers, TakeOver UK sells out in less than three hours, a preview of Raw, Fenix vs. Cavernario match & more. **Wai Ting and I will be back tonight with Rewind-A-Raw to review tonight’s show from Milwaukee, we will go through all the latest news and some announcements about our year-end shows. The show will be up late tonight on the site, iTunes and wherever you listen to our podcasts. **Today is the final day of our sale at store.postwrestling.com with 25% off all items using the code “Double Shot”. **The ASK-A-WAI thread is up on the POST Wrestling Forum where you can post your questions for this Friday’s show that will be available for members of the POST Wrestling Café. **The WWE announced Monday that the first NXT UK TakeOver special sold out in less than three hours. The event will take place from The Empress Ballroom in Blackpool, England on Saturday, January 12th and stream on the WWE Network. They will be running the arena the following night with television tapings. **Bray Wyatt returned on Saturday at the Starrcade event so it’s possible he could be back on television. Wyatt wasn’t out with an injury and has been off since they ended the storyline of Wyatt and Matt Hardy teaming. **Braun Strowman was scheduled for elbow surgery Monday to remove bone spurs and once the operation is complete, they will have a sense of the timetable for a return. The hope is that Strowman can work the TLC event next month against Baron Corbin, although that doesn’t sound like a fun match to be rushing back to have after surgery. **James Dixon at Wrestletalk is reporting that several members of the NXT UK roster have received new deals that will stop them from working for outside companies. The report states that those signed to new deals are going to receive an increase in their salary and prevent them from working anywhere except for WWE and the promotions they have relationships with. Talent will be allowed to finish their remaining bookings but will be unable to wrestle talent under contract to Ring of Honor, Impact Wrestling, New Japan, and World of Sport. Mike Johnson has added that talent can still work for promotions with existing relationships with the WWE, which include Progress, wXw, ICW, Fight Club Pro, Attack! Pro Wrestling, Over the Top Wrestling, and Futureshock. However, they will only be allowed to work dark matches for those groups and cannot be streamed or taped. This was the same restriction that EVOLVE had to work with for NXT talent, but that was recently lifted and EVOLVE can now stream matches involving WWE contracted talent. **Tidal Wrestling in the U.K. has alluded to the story above by noting that Ligero will be working his final date for the promotion on Sunday, December 16th at the Temple of Boom. Ligero is teaming with Man Like Dereiss against The Super Smash Brothers on the card. **Pro Wrestling Chaos out of the UK announced Monday that Ligero, Flash Morgan Webster, and James Drake will no longer be able to work for them because of their contractual obligations and wished them the best in their future. **The funeral for Larry Matysik will be this Sunday at the Renner Funeral Home in Belleville, Illinois from 4-7 pm. **Jim Duggan spent several days in ICU over the weekend but has been discharged from the hospital. Duggan has not disclosed why he was hospitalized but is planning to release the details. **Ring of Honor has officially announced a Ladder War for Final Battle with Frankie Kazarian and Scorpio Sky defending the ROH tag titles against The Young Bucks and The Briscoe Brothers on December 14th at the Hammerstein Ballroom. **Independent wrestler MJF, who is the MLW middleweight champion, has suffered an elbow injury and stated he would out for 4-6 weeks. **The WWE stock rose almost 5% on Monday closing at $65.62. **Kaito Kiyomiya won NOAH’s Global League tournament at Sunday’s final at Korakuen Hall. Naomichi Marufuji won the A Block but suffered an injury and had to be removed from the finals. This caused a three-way match to take place involving the second-place finishers of the A Block as Katsuhiko Nakajima defeated Kenoh and Kohei Sato. Kiyomiya defeated Nakajima in the final to win the tournament. On the same card, Kotaro Suzuki retained the GHC junior heavyweight title over Tadasuke and the GHC junior heavyweight tag champions Hi69 and Minoru Tanaka retained their titles over Koji Kanemoto and Hiroshi Yamato. **I had a chance to watch the Rey Fenix (who goes by King Phoenix in CMLL) match with Barbaro Cavernario from Friday’s CMLL card at Arena Mexico. A clip from the match has circulated where Fenix missed a tope con giro and landed on the unpadded floor and later was reported he was injured in the match and won’t wrestle again this year. The match was stellar with Cavernario winning the two-of-three falls match in front of a hot crowd. The first fall lasted 4:25 and Fenix won with the Fire Thunder Driver and featured a beautiful rotational crossbody in mid-air to the floor by Fenix. The second fall saw Fenix land a tornillo to the floor and landed on his feet and the tope con giro to the floor spot. This caused the countout finish as Cavernario tied it up at 1-1. They went more than 11 minutes for the final fall and Fenix sold the landing for a long time. He still got a lot in for the final fall with a corkscrew dive to the floor and a double springboard into a Spanish Fly. The major spot saw Cavernario set up Fenix at the entrance by the steps and leaped off the stage with a splash onto Fenix. Cavernario submitted Fenix with Cavernaria to win the match. The match was unfortunate in the sense Fenix was hurt but it was a spectacular match. **Ring of Honor is working with Billy Corgan and David Lagana’s Lightning 1 company for a new series called “The Pinnacle”. The first episode dropped Monday and will be leading into the promotion’s Final Battle card on December 14th. The first show was an overview of Ring of Honor, discussing its history with the incorporation of old clips, names from the past and what Ring of Honor is. The series is narrated by Colt Cabana and it features interviews with Christopher Daniels, Jay Lethal, The Briscoes, Flip Gordon, Frankie Kazarian, and Ian Riccaboni. **Game Changer Wrestling has announced Masato Tanaka will be working their December 29th card in Asbury Park, New Jersey against PCO. **Here the updated standings for All Japan’s Real-World Tag League tournament following Monday’s show in Niigata: Shuji Ishikawa & Suwama (8 points), Kento Miyahara & Yoshitatsu (6), Joe Doering & Dylan James (6), Takao Omori & Manabu Soya (6), Kengo Mashimo & KAI (6). Jun Akiyama & Daisuke Sekimoto (4), Tajiri & Gianni Valletta (4), Ryoji Sai & Jake Lee (2), Parrow & Odinson (2), Naoya Nomura & Yuma Aoyagi (2), Zeus & The Bodyguard (0). **Brett Okamoto of ESPN reported that the UFC has put together a fight between former middleweight champion Anderson Silva and rising talent Israel Adesanya for the UFC 234 pay-per-view on Saturday, February 9th from Melbourne, Australia. This was a fight that many were discussing Adesanya’s recent win over Derek Brunson last month at Madison Square Garden. The fight is designed for Adesanya to knock off the legend and gain his most high-profile victory. Silva is 43-years old and 1-4 with 1 no contest since July 2013 when he lost the middleweight title to Chris Weidman. Silva last fought at UFC 208 in February 2017 and defeated Derek Brunson by unanimous decision in a fight that many believed Brunson won. After the victory over Brunson, Silva received a one-year suspension from USADA after Silva proved he took a contaminated supplement that led to a drug test failure in 2017 and has been cleared to return. **This weekend is going to feature two cards from the UFC and two from Bellator, which seems insane. The UFC will have the TUF Finale card on Friday night from Las Vegas headlined by Kamaru Usman taking on Rafael dos Anjos along with the finals of the TUF heavyweight and female featherweight tournaments. On Saturday, they have a Fight Night event from Adelaide, Australia with Junior dos Santos taking on Tai Tuivasa in the heavyweight main event. **Bellator 210 takes place on Friday from Thackerville, Oklahoma with Chidi Njokuani vs. John Salter in the main event slot. Saturday’s card is from Italy with an MMA card and kickboxing card being taped. The MMA portion is headlined by Alessio Sakara taking on Kent Kauppinen. Both Bellator shows will be airing on the Paramount Network and streaming on DAZN. **Jon Jones appeared on ESPN’s First Take on Monday to promote his upcoming fight with Alexander Gustafsson at UFC 232 on December 29th. Max Kellerman was on the panel and challenged him on the positive drug test he had after his second fight with Daniel Cormier. Jones repeated what he has stated prior that it was a trace amount and has no idea how it got into his system and believes he is still the best fighter in the world. **Andy Foster of the California State Athletic Commission spoke to Marc Raimondi at MMA Fighting regarding the commission’s decision to license Chuck Liddell for his fight with Tito Ortiz this past weekend.